The growth of gaming on mobile is "eroding" demand for social and casual games experiences on the PC, according to new data. Research by Cowen & Company shows that during September, DeNA and Gree cemented their positions in the top 20 grossing charts on Android platforms, while Electronic Arts gained ground on iPhone and iPad formats. 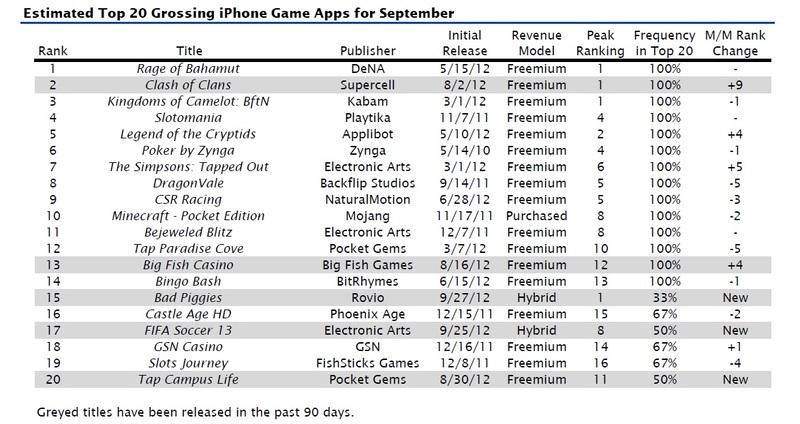 Rivals Zynga and Disney fell out of iOS circles almost entirely. DeNA and Gree have 30 per cent of the top 20 titles in the Android charts. 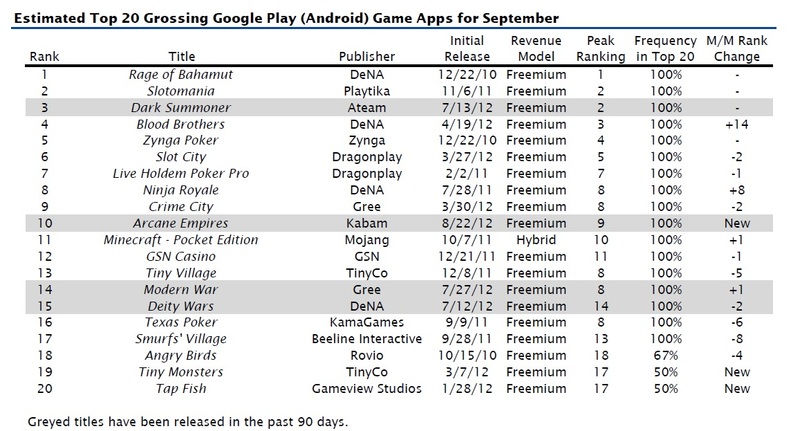 DeNA's Rage of Bahamut clocked its fifth consecutive month as the number one Google Play game and Cowen & Company also estimates the card-battle RPG was also the top-grossing game during September on iPhone. 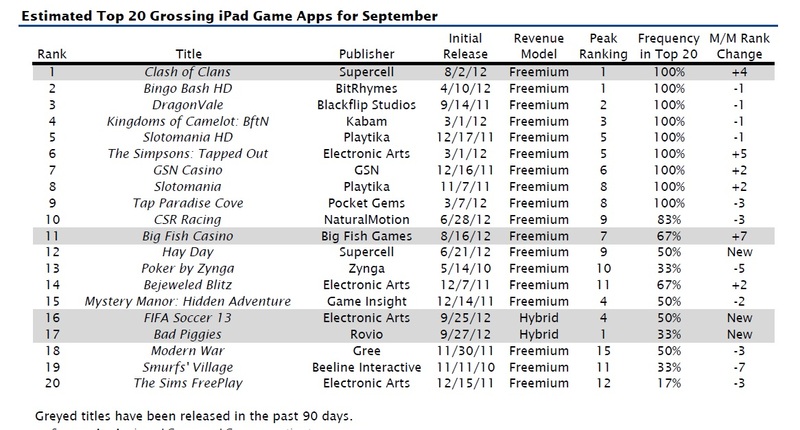 Independent developer Supercell had a strong month in September, with Clash of Clans for iPad taking the top spot in its second month and moving up to number two on the iPhone. "We continue to believe that evidence suggests demand for PC-based casual social gaming is eroding due to the increased availability of casual gaming on mobile devices," said analyst Doug Creutz. In the PC social gaming space, Zynga's FarmVille 2 pulled in 6.5 million daily active users which managed to offset the declines seen elsewhere during the month. Zynga's Slingo, The Ville, Bubble Safari and CastleVille all saw numbers slide, while neither EA's Sims Social and Sim City, nor Disney's Marvel Avengers and Gardens of Time, made the top 20 games by DAUs. Social gaming daily active users (DAUs) for the top ten publishers during September were flat, only up by 0.8 per cent, but monthly active users (MAUs) dropped by 9.9 million, or 1.8 per cent. All charts are based on research by App Annie and Cowen & Company estimates unless otherwise stated. Are these segments actually in competition with another in the way the title infers? PC based casual social gaming? You mean like playing Words With Friends on your $3000 gaming rig? I didn't even know it was available.